The handling of water, sand and soil is a great source of sensory experiences. Children enjoy themselves working with these materials whose properties allow a multitude of experiments. They refine control and coordination of hand movements. They gain awareness of the concepts of shape, state, weight, volume ... and learn to understand cause and effect relationships. 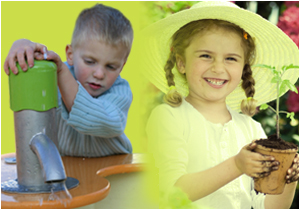 Gardening activities also help them understand how they can act on nature and understand the notion of life developing. In addition, gardening can also help develop children’s sense of smell.